My friends decided to play X Wing. I decided to write about. 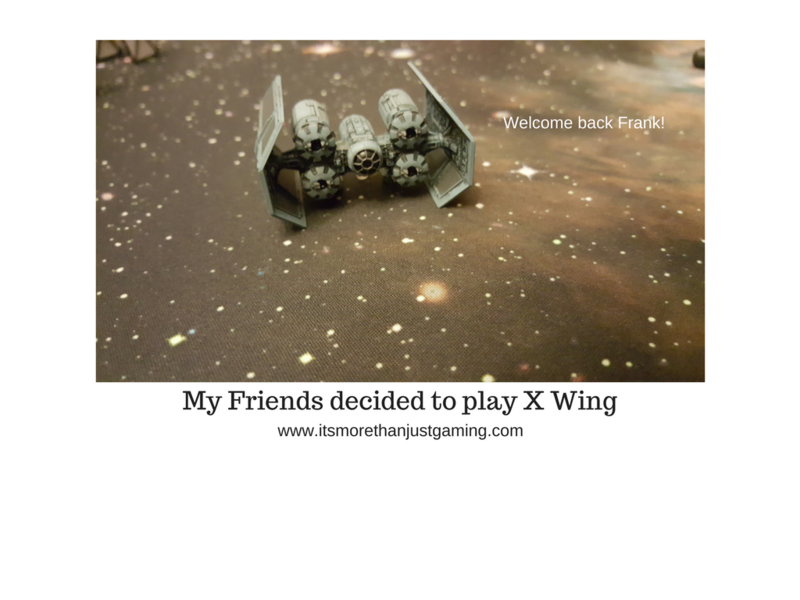 January 15, 2018 January 3, 2018 JohnFeatured / Games / Gaming7 Comments on My friends decided to play X Wing. I decided to write about. Turn one progressed quickly, but not uneventfully. Either due to accidental poor planning by Kylo Ren, or sabotage by Rebel Swines, several Imperial Tie Fighters suffered Bumps this turn. It didn’t hamper them over much but was a tad embarrasing for the pride of the mighty Star Fleet. The Rebels Sped forward with no such misfortune. No shots fired, though I daresay any spare pilots onboard Kylo Ren’s shuttle probably got lightsabred. Turn 3 was a good turn for the Empire, though Horton Salm in his Y Wing was at least holding on to some appearance of remaining competent. Another A Wing, in a dazzling display of speed and ferocity…flew straight through some wreckage. I don’t think we can even blame Kylo Ren for that one. Horton Salm managed to fire on Kylo Ren’s shuttle doing three damage to Ren’s Shield. If you are unaware, Horton Salm is the Y Wing pilot who, from a crippled Y Wing, shot down a Tie Interceptor (which I believe was piloted by Soontir Fel). Whether it was Fel or not, shooting down a Tie Interceptor from a functional Y Wing is impressive. Doing it from a crippled one (one of the engine pods was destroyed) is nothing short of awesome. So, Ren lost 3 shields and some dignity. But if it is any consolation, it was to a legendary pilot. Poe tried to take down the Tie SF piloted by Backdraft, though didn’t damage him. He then discovered why the pilot was called Backdraft. The Tie SF opened fire on Poe from its front guns (2 damage on shields) and then on an A Wing with its rear guns (1 Shield Damage). Kyle Katarn in his HWK 290 opened fire on Backdraft, but the Tie SF proved to be significantly more maneuverable than Katarns ship, which is a really good support ship but not a snubfighter. Finally, one of the Academy Pilots in one of the normal Ties winged Poe, but I believe his Astromech allowed him to regenerate shields anyway. Turn 4 is where things started getting messy. Both Rebel A Wings performed 180 reversals, allowing them to come surging into the fight. Poe was able to shoot down Backdraft, whilst Horton Salm managed to destroy the shields on the remaining Tie SF, even whilst obstructed by Kylo Ren’s shuttle. Kylo Ren fired on Kyle Katarn, though unfortunately one of the consoles damaged in his tantrum turned out to be the aiming console and the shots missed by miles. Katarn opened fired with his turret on an Academy Pilot, but the Tie was too nimble once again. One A Wing was able to draw in on one of the regular Ties, but even an Academy Pilot was able to evade the stressed A Wing pilot. The Academy Pilots returned fire on the A Wing, but to no avail. In Turn 5 all the action compacted into a small area of the play mat. Kylo Ren killed his engines, either by design or by accidental light sabre damage. We will never know. Salm did a 180 in his Y WIng, whilst evading heavy fire from the Tie SF, before thumping Ren’s shuttle doing significant damage to it. Dameron caught some stray fire and suffered a console fire (which would be awful in an X Wing cockpit, let alone something bigger…) whilst Kyle and Kylo exchanged fire one final time, resulting in the destruction of Ren’s shuttle. With a rebel victory innevitable (despite some earlier pessimism from the Rebels due to the power of Backdraft), victory was declared and MVPs announced. For the Rebels, Horton Salm in his sturdy Y Wing was declared most valuable pilot, whist the Imperials Posthumously awarded the same honour to Backdraft. Fun match to watch and the players seemed to enjoy it too. I have had the good fortune to play this game 3 times now, and it really is quite a lot of fun. I love the fact that it really makes you think: sure there is a luck factor, but overall it comes down to planning good strategies, which I love. The game is becoming increasingly (imo) unbalanced, with the empire getting a lot of direct-damage abilities and ships, scum likewise, but the rebels are getting a little outclassed in damage. Has led to it being increasingly less fun for me as a rebel player as half the time I will take 4-5 hits for every 1-2 I dish out, despite ship costs being generally costlier for what you get. This game was incredibly close, if Chris had focused his fire or gotten lucky Vs the A-Wings, I would have been screwed. I had shields left on the Y-Wing, everyone else had taken some damage, it was very close. Hmm… I guess that is true. The same thing happened to Magic the Gathering at some point, where people who had the most money to spent, seemed to win the game. But if one side gets overpowered I can understand it becoming even less fun. Hopefully Fantasy Flight will adress this issue soon. Because it really is a fun game. My brother plays this game a lot. I’m thinking it’s not really my thing. I would rather watch than play.